Used to convertÂ high impedance signal fromÂ measurement microphone into low impedance signal, Model 426A13 is designed for Â½ in. microphones used to measure frequencies within both infrasound and the human audible range (3 Hz to 20 kHz). Preamplifier electronics fit inÂ 0.94 in. long housing, and overall length (including connectors) ofÂ 1.4 in. accommodates space-constrained test environments. Noise floor allows measurements from 15 dBA to 147 dB with appropriate microphone. Depew, New York – PCB Piezotronics expands its microphone preamplifier family with the introduction of a new 1/2" short preamplifier. Model 426A13 is for test engineers and acoustic consultants taking measurements in spaces where traditional microphone systems won't fit or where space constraints are a concern, such as under automobile engines or in a cavity. 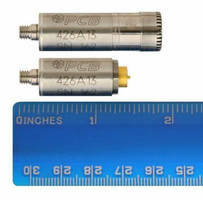 The preamplifier electronics of Model 426A13 are compact and fit in a housing that is only 0.94" (24.1mm) long with an overall length (including connectors) of 1.4 (35.6mm). Preamplifiers convert a high impedance signal from a measurement microphone into a low impedance signal. Model 426A13 is designed for 1/2" (12mm) microphones used to measure frequencies within both infrasound and the human audible range (3 Hz to 20 kHz). The low noise floor allows for measurements from 15 dBA up to 147 dB with an appropriate microphone. The 426A13, when paired with the appropriate microphone, can be used for sound pressure measurements in free-field, diffuse field (random incidence) and pressure response field. Common test environments include space-constrained cavities, impedance tubes, and under automotive and jet engines. When combined with a 1/2" (12mm) diameter microphone, the compact system provides high quality acoustic measurements at a very competitive price. It is in stock and available for immediate shipment. The expanded product line of preamplifiers includes: 1/4" and 1/2" inch short and standard lengths, preamplifiers with built-in gain, ventless, a-weighting and high-pass filters. PCB's broad portfolio of preamplifier and microphone combinations provides the flexibility for virtually all acoustic test applications. For additional information please contact Mark Valentino, Product Manager, at (866) 816-8892 or via email at mvalentino@pcb.com or visit pcb.com/ShortPreamp.